Despite the problems that the 4 biggest US online poker rooms are facing, there are still a handful of poker rooms accepting US players. Sites still accepting US players. So if you're looking to relocate your bankroll, these are currently the top 4 options for poker rooms that remain US friendly. Bodog would be my top choice for obvious reasons, followed by Bookmaker, with Aced and Cake Poker coming in some distance behind. How things have changed since April 15th. Are there any other sites? That's all the rooms/networks I know of. 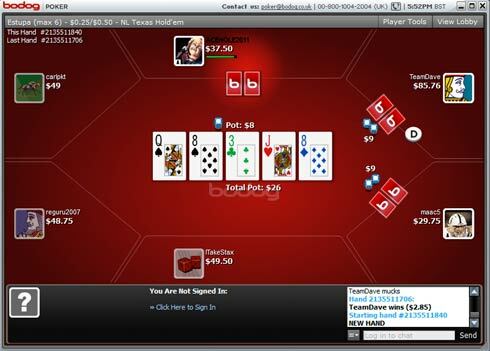 Bodog is an Independent room, so there are no similar alternatives to them. Bookmaker Poker is a nice reliable choice, as they are a huge sportsbetting company that happens to host a poker room too. The only downside is that the player traffic is low, and the software isn't amazing. After that, you've got the Merge and Cake networks, who are also still happy to accept US poker players. If I think of any other good alternatives, I'll update this page. Or if you have any news, I'd love it if you could send me an email.